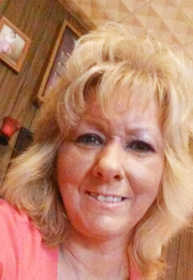 Paula Ann Cleveland, 54, of Gosnell passed away on the morning of December 31, 2018. She was born on April 16, 1964 in Osceola Arkansas to Carl and Marie (Shatwell) Lindsey. However, she spent most of her life in Gosnell. She worked for Bush Canning for 13 years until the company moved away from Blytheville. She’s been a homemaker most of her life. Paula was a Christian and loved her Lord and Savior. She was a member of Bethany Baptist Church. She taught Sunday School for ages 3-5 for a couple of years until she became ill.
Paula enjoyed her cell phone! She loved taking pictures of herself and her family. She would post them on facebook to share with others. She also enjoyed the make-up apps available on her phone. Someone said she would have made a great make-up artist! She was hoping she could see her grandchildren grow up, but she was also ready to “go home to Jesus.” Outside of the Lord, Paula loved her family more than anything. They were her hobby, her entertainment, the loves of her life! Paula was preceded in death by her parents; four brothers: Gary Lindsey, Johnny Lindsey, Jerry Lindsey, and Freddie Lindsey. and a host of other relatives and friends that will miss her dearly. Funeral services will be Thursday, January 3rd, 11:00 a.m. at Bethany Baptist Church in Gosnell, officiated by Bro. Gary Hyde. Visitation will be Wednesday, January 2nd, 4:00-6:00 p.m. at Bethany Baptist Church. Burial will be in Carney Cemetery. Condolences may be offered at carneyfuneralhome.com.